UNITED NATIONS, Aug 9 2012 (IPS) - When the United Nations advocates the protection of the world’s oceans, its political agenda transcends the battle against marine pollution, global warming, overfishing, greenhouse gases and sea-level rise. “We are also talking of high seas piracy and growing conflicts over maritime boundaries,” says one U.N. official. And as piracy continues to be on the rise, the United Nations is now pushing for a summit meeting of West African leaders aimed at thwarting high seas crimes in the Gulf of Guinea. Supported by the 15-member Economic Community of West African States (ECOWAS), the meeting is to take place before the end of this year. 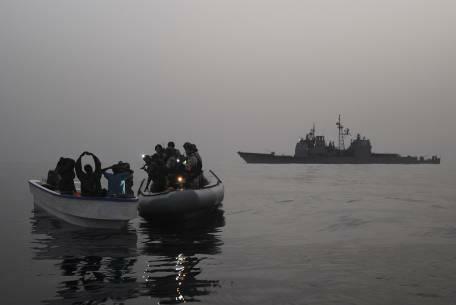 A U.N. assessment mission on piracy, whose members visited Benin, Nigeria, Gabon and Angola late last year, recommended that a summit meeting on maritime security be convened “as soon as possible to develop a comprehensive strategy” against high seas crimes. According to the International Maritime Organisation (IMO), incidents of piracy rose from 45 in 2010 to 64 last year. The concern over maritime security comes amid a growing dispute between China and its neighbours over claims in the South China Sea involving the Paracel and Spratly Islands. Abdel Fatau Musah, director of political affairs at ECOWAS, points out that the decline in piracy in Benin, the most affected in ECOWAS, doesn’t mean high seas crimes have peaked. But there has been a rapid spread of the phenomenon to other states in the region, including 18 attacks last year alone in Nigeria, Ghana, Guinea and Cote d’Ivoire. Musah told a recent meeting of the U.N. Security Council that piracy was increasingly dovetailing into other forms of transnational organised crime, including oil bunkering, robbery at sea, hostage-taking, human and drug trafficking and terrorism. And when the United Nations hosts an international conference to commemorate the 30th anniversary of the Law of Sea later this week, piracy will be the subtext of the discussions to be presided over by Secretary-General Ban Ki-moon. Scheduled to take place Aug. 12, the conference will coincide with the closing ceremonies of the international exhibition Expo 2012, currently underway in the coastal town of Yeosu in South Korea. The theme of Expo 2012 is the protection of the world’s oceans and maritime resources. Ambassador Hardeep Singh Puri, India’s permanent representative to the United Nations, told IPS his country had been at the forefront of highlighting “the menace off the Somalia coast”, and was also concerned about the surge in piracy in the Gulf of Guinea. “While the two situations were quite different in proportion at present, the failure of the international community to act decisively against piracy off the Somali coast could have spawned the new surge of piracy in the Gulf of Guinea,” he said. He pointed out that piracy off the African coasts reflected the instability prevalent in the region and the reach of organised terrorist and criminal groups. The perpetrators, he said, were targeting oil and chemical vessels, as well as oil-drilling platforms in the Gulf, and employing severe violence against their captives. The region, he said, produced more than five million barrels of oil daily and three-quarters of the world’s cocoa supply. Pirate attacks were thus adversely affecting the emerging oil industry of the region, as well as commercial shipping and marine traffic. In a resolution adopted last December, the General Assembly recognised the crucial role of international cooperation at the global, regional, sub-regional and bilateral levels in combating threats to maritime security, including piracy and armed robbery at sea, in accordance with international law. The resolution also recognised that bilateral and multilateral instruments and mechanisms are necessary to monitor, prevent and respond to such threats, and enhance the sharing of information among member states to better detect, prevent and suppress such threats, and to prosecute offenders with due regard to national legislation. Currently, at least three organisations, the International Maritime Organisation, the International Maritime Bureau and the Bureau overseeing the Regional Cooperation Agreement on Combating Piracy and Armed Robbery Against Ships in Asia, are coordinating efforts to collect and share accurate information.